Once you’ve added the coconut milk, be sure not to boil it too long or else the milk may curdle. You can substitute yogurt or plain milk for the coconut milk for health reasons. 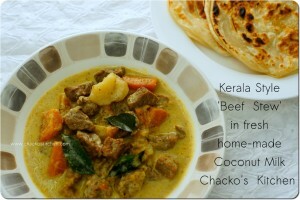 Thank you to Chacko’s Kitchen for submitting this recipe. Clean & cut the beef into 1″ cubes. Drain. Peel & finely slice the shallots. Finely slice the tomatoes & store separately. Peel, wash, & cut the potato & carrot into 1″ cubes. Heat 2 tbsp cooking oil in a non-stick pan. Add the Garam Masala ingredients (cloves, cinnamon, cardamom, & star anise) & saute for 1 minute. Add shallots (reserving about 1 tbsp) & saute until translucent, taking about 5 minutes. Add the drained, cubed beef, potato, & carrot along with the turmeric, salt, & pepper. Saute until all sides are seared & lightly caramelized and browned. Add the tomatoes, green chilies, & ½ the coconut milk. Transfer to a pressure cooker & cook on high heat until 1 whistle, reducing to a medium flame. Continue to cook for 20 minutes & then 10 more minutes on low flame. In a separate non-stick pan, heat the remaining oil & saute the reserved shallots & curry leaves. Add the remainder of the coconut milk & bring to a boil on medium heat. Remove from heat. If you prefer the soup to be 100% Vegetarian, you can substitute vegetable stock for the chicken stock. I prefer to serve with toasted sourdough. A swirl of cream will make this look nicer and taste richer. Place the baby leeks in a small saucepan with the olive oli until the leeks are soft. Add the rest of the ingredients except for the chives, setting them aside. 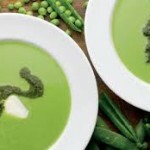 Simmer until the peas are cooked through. Add the chives to the pan & use a hand blender to blend until smooth, or your preferred consistency. 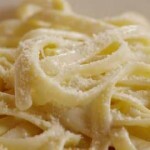 Alfredo sauce is one of the best sauces – good on all kinds of pasta! On medium heat, melt butter & add flour. Cook 2-3 minutes, stirring constantly to cook flour completely. Add cream & broth together, blending well. Add cheeses, parsley, garlic, & wine, stirring until cheese is completely melted. Add salt & freshly ground black pepper to taste. The serving size depends on the size of the fish. Preheat oven to 400°F. Rinse the salmon well under cold running water & sprinkle inside the cavity with salt & pepper. Stuff with half of the red onion slices, half of the lemon slices, & all of the parsley. Lay the salmon on enough aluminum foil wrap to enclose fully. Rub both sides with olive oil, sprinkle with salt, pepper, & thyme. Scatter the remaining onion & lemon slices on top & seal foil tightly around salmon. Bake on baking sheet 40-45 minutes, adjusting time for size of salmon. Cool salmon in foil on cooling rack, then remove onion & lemon slices. 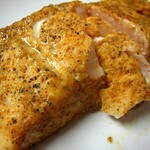 Remove skin if desired & served baked salmon at room temperature. Photos courtesy of bloomsberries and Ernesto Andrade on Flickr. 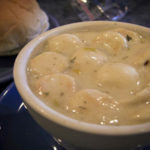 Gary Says: A great recipe for classic, New England style clam chowder on a cold day! In a medium to large saucepan combine onions, celery & potatoes. Pour clam juice over vegetables. Add enough water to barely cover vegetables. Bring to boil then reduce heat to medium & simmer until potatoes are tender (approximately 20 minutes). Meanwhile, in a small sauce pan, melt butter. When melted, add flour, blend & cook for 2 minutes. 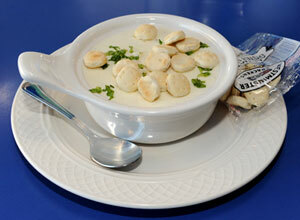 Add half & half & cook, stirring until smooth & creamy. Drain vegetables, reserving liquid. Return vegetables to saucepan. Add clams & sauce mixture. Heat thoroughly (add reserved cooking liquid to make consistency to your taste.